Peter Oborne won’t answer the question, Simon Scharma thinks he would be happy to be oiled up on a beach and Val McDermid thinks crime writers are amongst the happiest people around. We are in the Barclays Pavilion for the latest panel discussion and another selection of 25 Hay Questions about the way we live now. The panels in these sessions are too big and the format is too rigid to allow the conversation and ideas to flow as they might. Despite that Peter Oborne brings the afternoon alive with his condemnation of teaching unions. 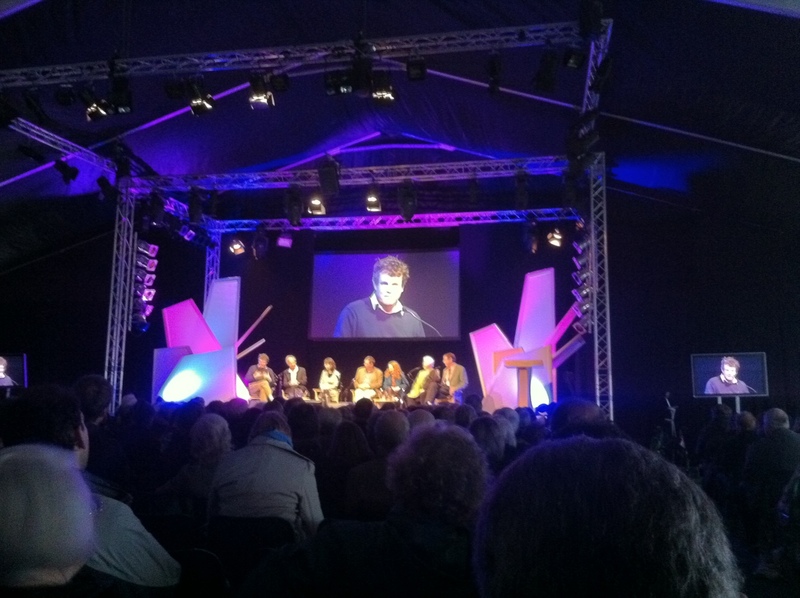 I’m sure Oborne must know that this is half-term and teachers are disproportionately represented at Hay. It turns ugly and the boos outweigh the claps by some margin, though I suspect that many aren’t actually listening to the politically conservative, socially liberal argument that Oborne makes. The next time Oborne speaks the severe winds whip up and part of the tent dressing is blown over “is something biblical happening?” he asks.